Can Animals Figure Out What Minerals They Need? Not only will this help you understand if you should provide cafeteria minerals to your herd, but it will also give you some new insights into how creatures choose what to eat. A number of companies in the U.S. sell free-choice or cafeteria-style mineral supplements. Their rationale is that ruminants will select the minerals they need and in the quantities they require for maintenance, pregnancy and growth. Is this a good idea? Not according to many animal nutritionists who will tell you ruminants are incapable of consuming minerals in correct amounts to prevent or correct mineral deficiencies. They even cite studies support this claim. Unfortunately, researchers who designed and conducted these studies made questionable assumptions about diet selection. Research at USU has demonstrated that ruminants must learn about foods and the consequences of eating those foods before they can make correct choices. Diet selection is not innate nor is it driven by instinct. This was not factored in by early studies on nutritional wisdom that focused on the innate ability of livestock to balance minerals in their diet. Listed below are assumptions made about these mineral studies and alternative explanations about how animals learn about foods and nutrients, including minerals. Assumption 1. Animals are “genetically programmed” to instinctively recognize needed nutrients similar to the way animals regulate intake of sodium. You can read more about how animals figure out what’s good to eat by clicking over to this article by Darrell Emmick. Animals don’t instinctively recognize nutrients. When an animal eats a food that contains needed nutrients, once digested the effects of those nutrients on cells and organs in the body feedback to the brain causing an animal to prefer the food. Experiences with foods shape food preferences. Let’s use the example of sodium, an “instinctively” recognized nutrient. When an animal eats salt, it dissolves into sodium and chloride ions, and is immediately absorbed into the blood stream. Feedback from sodium is almost instantaneous, so fast that it may appear the animal instinctively recognizes sodium. Assumption 2. Animals eat nutrients in exact amounts needed to meet their daily requirements – no under or over consumption. There is no scientific evidence animals eat to prevent nutritional deficiencies. Instead, they respond to excesses, deficits, and imbalances in their diet. While they may under- or over-consume needed nutrients within a meal, they generally do a good job of meeting their daily nutritional needs. When animals suffer from deficits or imbalances, they seek out different and sometimes unusual foods, like soil, bones or manure. If eating something rectifies the deficiency or imbalance, the animal forms a preference for that item. Assumption 3. All individuals select nutrients in amounts that match NRC requirements. Many researchers have little appreciation for individual variation of animals. Researchers often view variation as an enemy of statistics. In reality, individuals within a species vary in their need for nutrients. Every animal has its own unique body structure and physiology causing it to need different amounts of nutrients, including minerals. An animal’s past experience with foods also shapes food preferences and influences diet selection. Assumption 4. Social learning and culture are not a factor in nutritional wisdom. 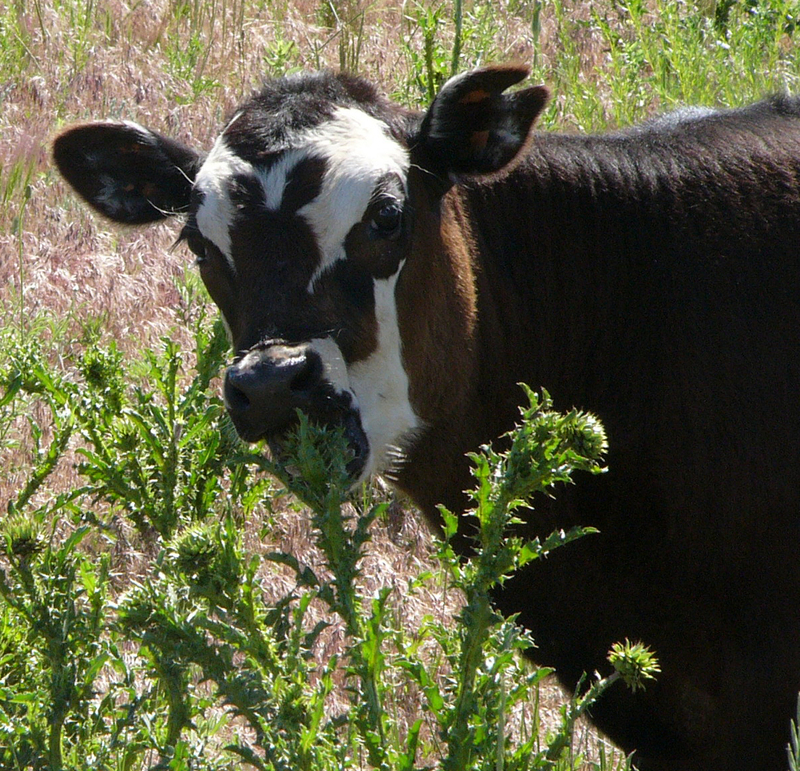 This calf is eating musk thistle, just like her mom taught her to do. Social learning and culture are critical for animals to acquire nutritional wisdom. Animals that learn about foods from mom or herdmates are more productive than animals that have to learn about foods solely by trial and error. 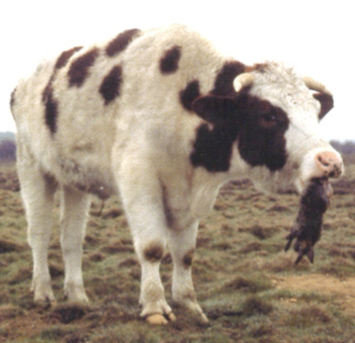 Wild animals are often considered better than livestock at balancing their diet. However, wildlife have an advantage over livestock because they tend to stay with their mothers until they are much older, aiding in the transfer of information about foods and environment over a longer period of time. They also tend to live in the same place for generations enabling one generation to pass on information about surviving in their environment to the next generation (Provenza and Villalba, 2006). If animals can learn to prefer foods that contain needed nutrients, then why didn’t they learn to consume minerals in the correct amounts when fed in cafeteria trials? Given the design of most mineral cafeteria trials, animals may have been more confused than educated about the value of minerals. Listed below are some possible problems with past studies that may have made it difficult for animals to consume minerals in expected amounts. 1. Sodium was often mixed with every mineral. Many minerals are required in very small amounts and can be toxic if too much is eaten, so researchers mixed minerals with salt to limit intake. Unfortunately, animals only required a limited amount of salt each day and it may have either encouraged or limited the intake of other minerals. Also, given the flavor of salt, the minerals probably tasted similar. Animals discriminate among foods by flavor. If the minerals tasted similar, animals may not have been able to associate feedback from the mineral with its flavor. 2. Flavor is more important than color. Researchers colored the minerals so livestock could discriminate among them. As stated above, animals discriminate among foods by flavor not color. If foods taste the same, they are the same to the animal regardless of how they look. We select foods the same way. If a bowl of jellybeans are all lime-flavored and you don’t like lime jellybeans, then you won’t eat them even if they are in different colors. It’s flavor that matters. This steer was part of a trial to see the effects of grazing on phosphorous deficient soils. The herd decided to solve the problem by eating dead rabbits found in the pasture for the phosphorous in their bones. Want to know more about this? Leave a comment for Kathy and she’ll tell you how this picture made her what she is today. 3. Animals eat to rectify problems, not prevent them. Researchers expected animals to eat minerals to prevent deficiencies but animals eat to correct, not prevent, deficiencies. When animals eat diets adequate in nutrients, they usually continue to eat the same diet. If animals are deficient in nutrients, they seek new foods. Animals develop preferences for foods that correct deficiencies. 4. NRC recommendations don’t consider individuals. Researchers thought animals would eat minerals in the amounts recommended by the National Research Council (NRC). However, NRC recommendations are often higher than an animal’s needs. Some minerals can be stored in the body and don’t need to be eaten daily. In addition, many minerals are only needed in small amounts, a few grams or milligrams per day. A single bite may be more than an animal needs for the day. Finally, whether or not an animal consumes a mineral depends on the mineral status of the animal and the composition of the mineral compound offered. For example, cows deficient in calcium tend to avoid phosphorus (Provenza and Villalba, 2006). Considering the complexities of plants and landscapes, most researchers never imagined that animals were learning about the foods they eat. A better understanding of diet selection is leading to better experiments to determine if animals can learn to rectify mineral deficiencies. One important change in these studies is allowing animals the opportunity to pair the flavor of a mineral with recovery from a deficit of that mineral. In one study, lambs avoided phosphorus (P) when P was fed in excess, and increased their preference for P during periods of P deficiency (Villalba et al., 2006). In another study, sheep on a P-deficient diet increased intake of a P supplement when given a choice between a P or calcium (Ca) supplement. Conversely, sheep eating a Ca-deficient diet ate more of a Ca supplement than sheep fed a diet high in Ca (Figure 1). During the trial, we observed something we’d never seen, lambs licked and chewed the dirt not only in their own pens but also in their neighbors’ pens. Lambs also licked urine puddles while their neighbors were urinating and ate feces from their neighbor’s pens. Lambs in the study were randomly assigned to pens, so lambs on a high P and low Ca diets were often penned next to lambs on a low P and high Ca. They were apparently alleviating their mineral deficiency by licking urine and eating feces from their neighbor’s pen. Once the behavior was discovered, lambs were moved to separate areas to finish the study (Villalba et al., 2008). Mineral nutrition is extremely complex. The amount of a particular mineral an animal will eat depends not only on the level of that mineral in the body but also on its interactions with other minerals. The body’s feedback mechanisms likely enable animals to make correct choices and maintain their mineral status. The study above indicates animals correct for Ca and P deficiencies. So What Minerals Should You Provide? 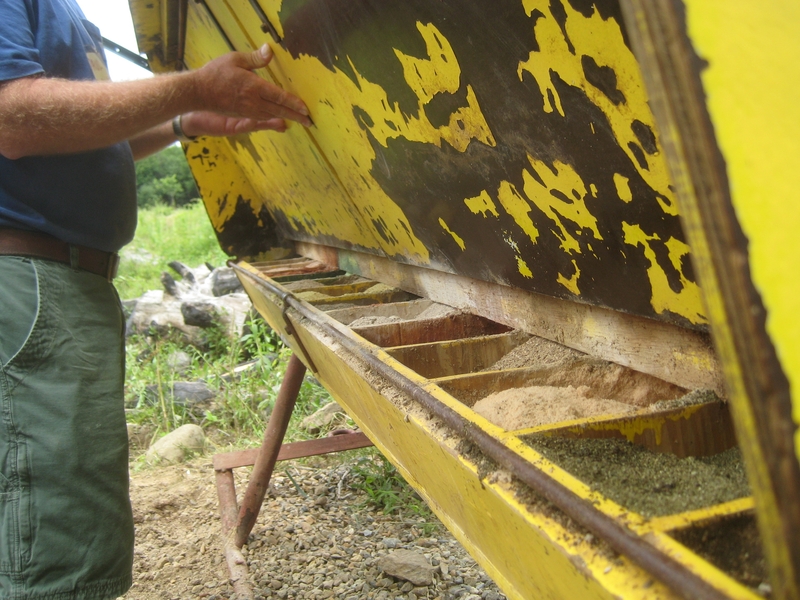 Should you invest in a cafeteria-style mineral program with a full complement of minerals? Probably not. It can be expensive to supply animals with minerals they aren’t likely to need, so focus instead on what they are most likely to be deficient in. In Utah, where I live and work, the most common mineral deficiencies are copper, manganese, zinc and selenium and the most common vitamin deficiencies are vitamin A and E. Focus on supplementing your animals with salt and the minerals and vitamins listed above. To find out what you might be lacking in your area, visit with your veterinarian, or your local NRCS, Conservation District, or Extension staff. Vertebrates: From Structure to Function. CABI Publ., Oxfordshire, UK. pp. 210-240. Dissociating taste from post ingestive effects. J. Anim. Sci. 84:2213–2223. Villalba, J.J., F. D. Provenza, and J. O. Hall. 2008. Learned appetites for calcium, phosphorus, and sodium in sheep. J Anim Sci 86:738-747. Did You Know Your Herd Has Its Own Culture? Yep – And That’s Why They Eat What They Eat! In very leached sandy soils, like Central Florida mineral deficiencies are notorious. With free choice cafeteria style minerals our cows have been able to select and make up or excesses or deficiencies very well. Our latest improvement has been separating the trace elements as the water has a Iron excess, now their coats looks much shinier and mineral consumption is very low. I don’t understand why you say that a cafeteria style mineral program would be very expensive as the cattle would only consume what is lacking or to balance an excess. Actually is the best ( for the animal ) and cheapest way to effectively provide needed minerals in the proper ratios.